Shipping $38.88 Add item to cart for shipping estimate. You can SAVE on shipping by buying multiple items from the same seller. Shipping is charged by each individual seller. Sellers at times may also provide FREE SHIPPING on select items or on entire order if it meets the minimum order value. Please check sellers page for more details. A perfect home decoration showpiece for Animal Lovers. This beautifully hand painted Leather Hippo will add elegance to room in your home. 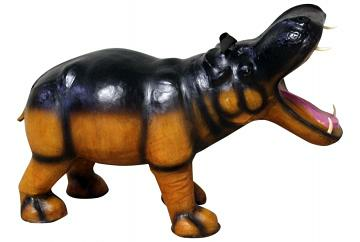 This Hippo figurine is handmade hand painted with acute textures that make it look authentic. Shipping Cost $38.88 Buy multiple items online from Favors Handicraft to SAVE on shipping. This item in Home Decor category was first added to our catalog on 03-23-2016. Buy Handmade 23" Tall Hippo Leather Figurine, sold & shipped by Favors Handicraft where you can shop online for Handcrafted Carved Furniture, Home Decor, Statues, Mandir & Gifts. This Home Decor collection has been tagged as Large Statue, Home Decor, Living Room Decoration, Animal Handcrafted Showpiece.